“I was an Android user before, but now I want to change to use iOS. So I bought a new iPhone 7 a week ago. Soon I realized that I have no idea of how to backup iPhone 7. Can anyone give me some tips, thanks!" You’ve never know the importance of backing up iPhone data until you encounter data loss. Especially losing some important data. For example, your kid’s first step video, family gathering photos, valuable contacts, critical documents, etc that saved on your iOS device. Some of the users even don’t know how to back up iPhone to iCloud, especially for new users. Please pay high attention that if you don’t backup your device, once the lost data being overwritten by newly generated data, there is no way to recover it back because of no available backup files. To avoid data loss of iPhone, iPad or iPod, users should back up their data using iTunes or iCloud regularly. Some of the iPhone users want to backup iPhone to computer not iCloud, but they don't know how. Here I will introduce BOTH the ways to backup iPhone to computer and iCloud. 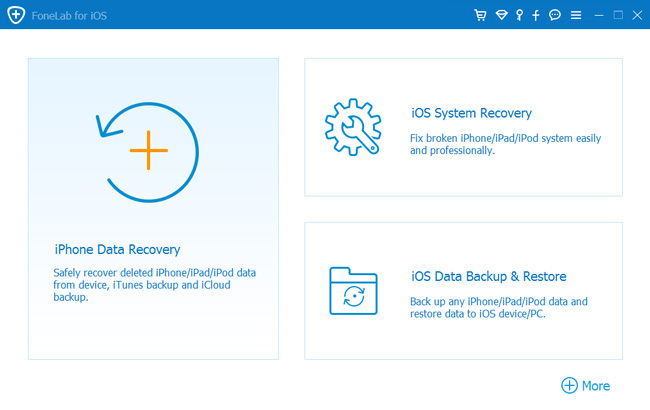 What's more, FoneLab iOS Data Backup & Restore, an iPhone data backup and restore software is also recommended to use, which can selectively copy your iPhone contents to Mac/PC, and restore the backup to the device. iTunes creates backups of your iPhone, iPad or iPod right on your computer. Therefore you will have plenty of free storage space to save your iOS data. Check below steps to back up data to computer. Step 1: Connect your iPhone to the computer and iTunes should run automatically, if not, open it by double-click iTune on computer. Step 2: iTunes will recognize your device for a few seconds. Step 3: Save contents that you downloaded from iTunes Store or App Store by clicking File – Devices – Transfer Purchases. Step 4: Then click File – Devices – Back Up to save data on computer. Where does iTunes store iPhone backups after the process is finished? For Mac users: The iTunes backup will be saved on below directories. Want the Easiest Way to Backup iPhone to Computer without iTunes? FoneLab - iOS Data Backup & Restore: Backup iOS data to your PC/Mac and restore contacts, notes from the backup to device easily. How to backup iPhone using iCloud? As long as below conditions are satisfied and iCloud Backup is enabled on your iPhone, iCloud will create backup automatically once a day. To enable iCloud Backup, go to Settings – iCloud – Backup – Turn on the iCloud Backup switch. Your device is connected Wi-Fi. Your device is plugged to a power source. Your device is screen locked. Your device has enough iCloud storage space to save the data. However, you can manually backup iPhone to iCloud as well. On your iPhone, go to Settings – iCloud – Backup – Tap on Back Up Now. Please make sure that your iPhone is continually connected to a Wi-Fi network during the process. Check whether the backup is complete or not by tapping Settings – iCloud – Storage – Manage Storage (iCloud – Storage & Backup – Manage Storage for earlier version of iOS), and then select your device. The backup you just created should appear in the details with time and size of the backup. Backup and restore iOS data to your PC/Mac easily. Preview data in detail before you restore data from backups. Backup and restore iPhone, iPad and iPod touch data Selectively. Now download the software with below link accordingly and then follow the below guide to backup your iPhone. Step 2: Connect your iPhone with the computer. Then tap Trust on your device home screen if it pops up. Step 4. You can choose Encrypted backup if you want to protect your backup files with password. Or just select Standard backup to move on. Step 5. It allows you to select the type of data you want to backup. If you want to backup all data, just tick the box next to the Select All option on the bottom-left. Step 6. Click the Next button and wait for it. If your computer won't recognize iPhone or you don't have enough iCloud storage, this is the best option to backup your device.